We will buy it every so often as something different to have in the house. 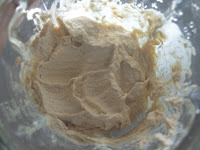 I knew it was easy to create but could never locate the tahini paste. I made a batch using a recipe that I discovered online, it was good, but I have to admit that I added way too much garlic. Now some of you may be gasping, shaking your head and asking how could she even think that way. *raises hand* I love garlic, grew up eating it for as long as I can recall, but this time it was knock your socks off too much. Today, I decided to try my hand at another batch. Went looking for the recipe and it was no where to be found, do I look it up again or wing it? Ah, let’s wing it today! Gathered up all my ingredients, pulled out the old blender and I was ready to go. Oh, yeah, I also grabbed a piece of paper to write down my recipe, something that I think about after I am done. I mixed it all up and I have to admit it is really good. It is nice, creamy and smooth. The last batch that I made was a bit lumpy. My recipe is below and feels free to add any spices you would like to it. Ingredients are in the blender just waiting to have a spin. I noticed while snapping the picture that I forgot the tahini paste, good thing I took the picture. The ingredients all mixed and ready to eat. Add in 1/3 cup of juice from the garbanzos*. 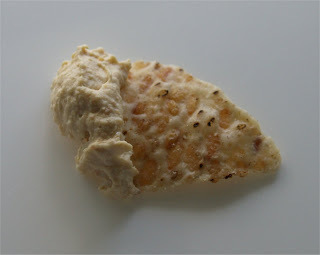 * You can add more juice if needed, this will thin out your hummus. You can add any spice you would like, and have fun with the recipe. 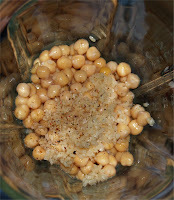 You can also use dried garbanzos - just soak them for a few hours (overnight) and bring to a quick boil. Dried they will keep *forever* and any left overs can be used in salads, mixed with other beans, or even *gasp* eaten as a side dish! Thanks for the tip! I will have to search for some dried garbanzos and give them a try.